All Day Entertainment for the Whole Family!! 'Country roads, take me home, to the place I belong...' Put on a pair of jeans, dust off them'ol Cowboy boots, grab your hat and come join us for an unforgettable funfilled day, with great names in Country music. Legends like Clive Bruce, Billy Forrest, Dalene and Matt Hurter will be performing. There will be a Beer Garden for the thirsty, an Auction for the collector, Competitions for the little cowboys and cowgals, to name but a few. 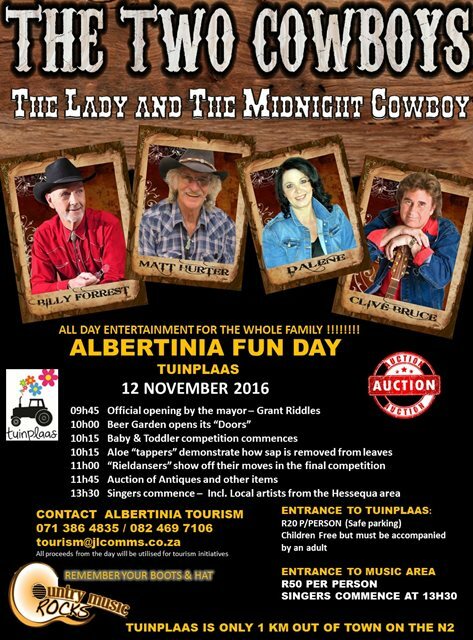 You will find this funpacked day at the NEWLY build "Die Tuinplaas" just outside Albertinia. 10h00 : Beer Garden opens its "Doors"
13h30 : Singers commence - Incl . Local artists from the Hessequa area. Children Free but must be accompanied by an adult. Tuinplaas only 1km out of Albertinia on N2 on route to Mossel Bay. 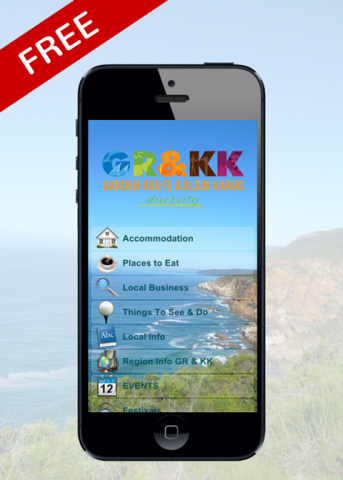 The Garden Route and Klein Karoo App is now also being used by the "Jewel of the Garden Route" Plettenberg Bay. There is keen interest and a marketing drive by Plett Tourism and Members, who have jumped on board to form part of this versatile platform. The app includes regional listings that include accommodation, business, local info, events, festival ,things to do & see, as well as places to eat. The app integrated Social Media linkages, which enables businesses to share content to Facebook and Twitter - an easy way to promote your business and to promote its brand. Seeing is believing, right? Download this FREE App and see for yourself. Available on all major platforms.